Philip ‘Billy’ Leslie from Triple R indicated that it was already dark when the accident took place. He shared with The San Pedro Sun that when the two boats collided, Austin was thrown overboard landing near the propeller of his own boat. He suffered lacerations to his right arm, a broken bone and crushed fingers. As for the two other men manning the second boat, they received minor injuries which were treated at the Polyclinic. 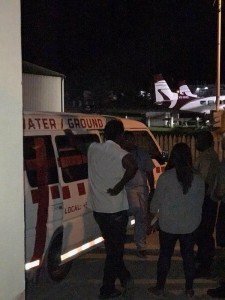 Thanks to the BCG’s quick response and movement of the injured persons to the Sunset Boardwalk boat terminal, Leslie was able to transport them to the Polyclinic’s emergency room for emergency diagnosis. Due to the severity of Austin’s injuries, the team was informed that he would need further medical attention off the island. 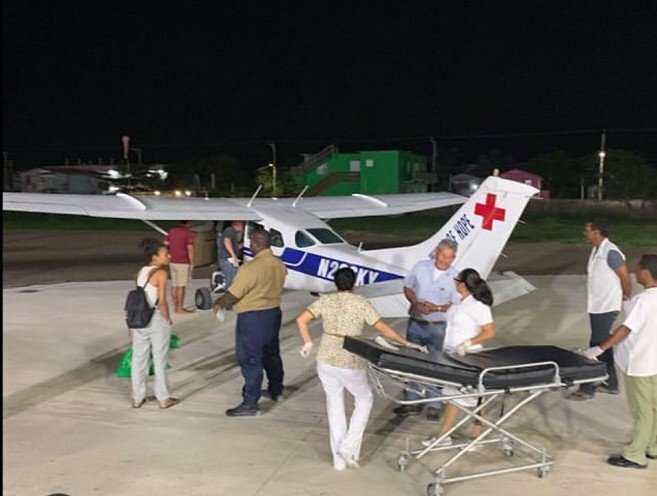 Arrangements were made to fly him to Belize City via Wings of Hope, where he was transported by the Belize Emergency Response Team to Belize Healthcare Partners to undergo a four-hour surgery. According to Leslie, the operation was a success, and Austin’s arm was saved. He is now recovering. Leslie leads the Tripe R team on the island and is proud to be able to help in cases of water emergencies. “Our main role is to assist emergencies and to tend to victims in the least amount of time possible,” said Leslie. “We are very proud of our work and are happy to have the opportunity to help seafarers in troubled times.” So far, there is no indication if the police are investigating the accident. The officer in Charge of the Coastal Executive Unit Superintendent Reymundo Reyes was contacted regarding the incident, but there was no comment. Triple R, along with their evacuation team, is a charitable organization based in Houston, Texas USA. Traci and Jim Curtin formed the organization in memory of Rickilee Mercer, an American National who was found dead on the leeward of Ambergris Caye on March 1, 2017, after she had gone jet skiing north of the island. Almost two years following Mercer’s tragic death, the group has accomplished much under a knowledgeable, organized team, and continues to upgrade its equipment and response tactics. They have become the point of contact for water emergencies around Ambergris Caye, and can be reached out on their 24-hour number, 627-1117.